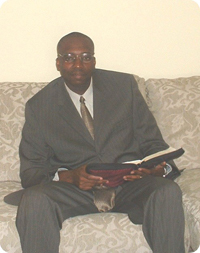 Elder Daniel F. Rivers Sr. is the Pastor of Oaks True Holiness Church, located on St. Helena Island SC. He, along with his wife, First Lady Sarah Rivers, resides in Burton, SC. Pastor Rivers became ordained as an Elder in 1990 and installed as the Pastor of this church in 2003, under the leadership of Pastor Emeritus, Elder Willie J. Fenelle. Elder Rivers has a passion for teaching the true and unadulterated word of God. Much of his life in the ministry has been inspired by the church founder, the late Teacher James Grant and his father, the late Elder Arthur Rivers. Although they are gone on, his endeavor is to carry on this great gospel! (Blessed are the dead which die in the Lord…, that they may rest from their labours; and their works do follow them,” Revelation 14:13). Thus, their legacy of this great gospel shall live on as he continues in labor in this ministry.